£30 Voucher prize every month! We have revived our monthly Photo Competition (we had suspended it last year) and now have a WhatsApp number and Facebook photo album people can use to send photos - hopefully making it a LOT easier! Try to make sure the photos are in focus and ideally taken on a bright (but NOT sunny) day. If photographing a CB, make sure it's switched on and all controls are in the correct position (i.e. RF gain and Mic gain turned up - if your CB has these controls). each of the 4 could be worth a maximum of 10 points, giving a maximum possible score of 40 - the person with the most points wins the prize! Your installation doesn't have to be perfect, or even neat, just as long as it's there and functional... all photos will give the viewer an idea of how and where an item can be installed, we're not judging the quality of your installation and it's not a competition to see who's done the best job! For your protection, any photos where number plates are shown will be edited so they cannot be read. We're hoping that requesting photos like this will get us some good ones to use on the site for the benefit of our visitors and customers - if you're undecided whether you should bother or not please do! 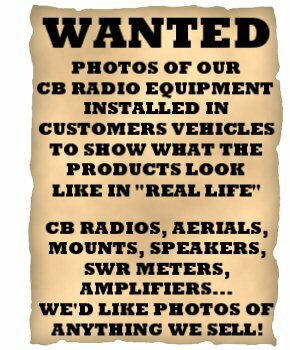 Please note that by sending us photos, you agree to let us (Communication Eleven, 4x4cb.com) edit & adjust any photographs you send and use as we see fit on our websites and printed literature. All photos will be gratefully received and are very much appreciated! In the past we have run special Photo Competitions with multiple prizes, giving away upto £250 worth of vouchers in a month... Below are statistics for the number of contributors (people who sent photos), photos received and winners. As you can see from how many people contribute each month and how many photos we received... there's a pretty high chance of winning if you send in a bunch of decent photos! This started as a £100 competition for October but many people continued to send entries in early Nov so we extended the deadline and added the £20 extra for the voucher that would've been won anyway in November.